Keyboarding is, perhaps, the most essential of all 21st-century skills. It is all too easy to fall prey to the myth that digital natives need no instruction on basic computer skills, including keyboarding. As typing becomes the primary method by which students engage with digital curricula, record lecture notes, complete homework assignments and even take standardized tests, the importance of learning to do this well cannot be overstated. With that in mind, here are five recommendations from TypingClub—a free, web-based typing program—to help you turn your students into proficient typists. Starting early matters. Anyone who's had to unlearn a bad habit can testify to the benefits of learning properly the first time. While the “hunt and peck” method may get the job done for the self-taught typist, much time can be saved and greater accuracy achieved by offering formal instruction, especially to young people. Students should start familiarizing themselves with a computer keyboard as early as they learn the alphabet. With TypingClub's Jungle Junior curriculum, young learners can explore those two new terrains together through interactive lessons. They'll learn to associate letters with keys on the keyboard, work on letter and sound recognition and eventually start typing sight words and short sentences. As an added bonus, children develop manual dexterity while learning to manipulate a new tool. Having fun while learning is an essential ingredient for developing new skills. Gamification—adding game-like elements to non-game contexts—can be an ideal way to teach keyboarding skills. Many educators tout increased student motivation and engagement, as well as improved behavior, in gamified learning environments. While the “hunt and peck” method may get the job done for the self-taught typist, much time can be saved and greater accuracy achieved by offering formal instruction. TypingClub’s playful approach can help foster curiosity and a love for learning. Students are encouraged to advance through educational games and entertaining instructional videos. Of course, a bit of healthy competition never hurts, either. Students can earn badges for their effort and collect points to score high on the class leaderboard. As with most things kids learn, students acquire keyboarding skills at different rates and in different ways. The more teachers can personalize keyboarding instruction, the faster and better kids will learn. TypingClub brings a little extra challenge into the typing practice by providing students with personalized, dynamically-generated content, which adjusts in real time. The algorithm constantly monitors student progress in order to provide a challenging learning experience at all times. Each student gets a tailor-made plan to work on his or her own challenges, which ultimately speeds up the learning process. Personalized reporting is also helpful for teachers. 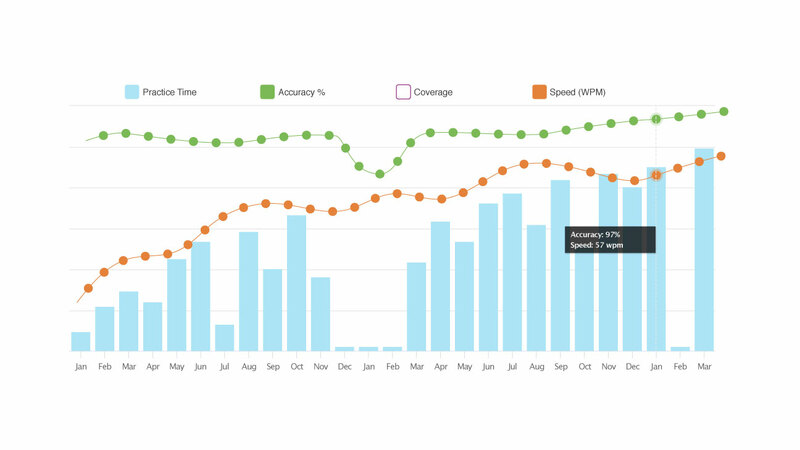 The progress chart allows users to display various metrics (time, accuracy, speed, coverage) at various time intervals (days, weeks, months). Ideally, students will always see the lines go up: the more time spent typing, the better the speed, accuracy and keyboard coverage. Student penmanship and legibility have long been a barrier to demonstrated learning. Typing naturally alleviates those concerns. More importantly, it addresses a number of accessibility issues that can begin to level the playing field for all learners, including students with physical and developmental challenges. One-handed typists are slowly introduced to new keys adjacent to the home row as they learn to spread their fingers outward to cover a larger radius of keys. A virtual on-screen hand guides correct finger placement. Visually-impaired typists benefit from compatibility with all the major screen-readers, audio feedback, high-contrast themes and extra large font options. Dyslexic typists may select OpenDyslexic font, increase font size or use a high-contrast setting to remove graphic elements surrounding the lesson text. Once our brain is trained to move the fingers through established patterns, we’re then able to type quickly and accurately. . . No longer focused on how we’re writing, we can now worry about what we’re writing. Muscle memory, which is built through repetition, is key when learning to type. Once our brain is trained to move the fingers through established patterns, we’re then able to type quickly and accurately. This process frees up space in our brains. No longer focused on how we’re writing, we can now worry about what we’re writing—and hopefully produce something worth reading. We all know that practice makes perfect. Introducing students to keyboarding in bite-sized pieces while encouraging repetition is an excellent way to achieve that goal. Sign up for an unlimited 60-day free trial of Pro Edition. Download resources, handouts and syllabi. Read a success story from National Heritage Academies in Michigan. Watch a quick video to familiarize yourself with the program. As schools across the country continue to digitize their learning environments, the number and variety of jobs requiring at least basic computer skills are, unsurprisingly, on the rise, too. If schools hope to send students into the workforce with requisite skill, keyboarding must be factored into that toolkit. The International Society for Technology in Education (ISTE) recognizes the need for digital-age skills. TypingClub was recently awarded a Seal of Alignment to the ISTE Standards for providing a comprehensive learning resource which enhances students’ digital skills. TypingClub strives to provide a platform that allows users to learn basic skills such as touch typing to become successful in the future. This article was sponsored by TypingClub and not written by the EdSurge editorial staff.